Instead of a large solitaire stone, why not try a fresh approach to diamonds? These luminous John Hardy earrings feature brilliant pave diamonds, adding modern sparkle to your look. Pave diamond center; 0.34 total carat weight. 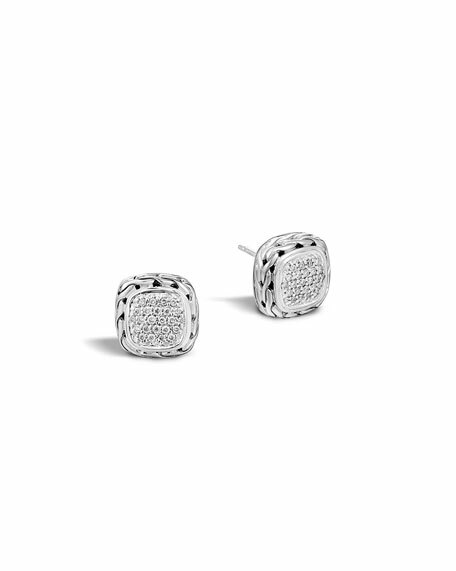 Square, sterling silver woven chain settings. John Hardy is one of the last companies to weavechain by hand, and the Classic Chain collectionreflects the brand's commitment to thepreservation of traditional Balinese jewelrymaking techniques. Meticulously weavingthe chain by hand allows a smooth andsupple drape that follows the contour ofthe body. Designed in 18-karat gold, sterlingsilver, and an array of stones.